ABWA Crescent City Connections Express Network is a business association comprised of dynamic business women with a strong mix of women business owners and women business leaders. 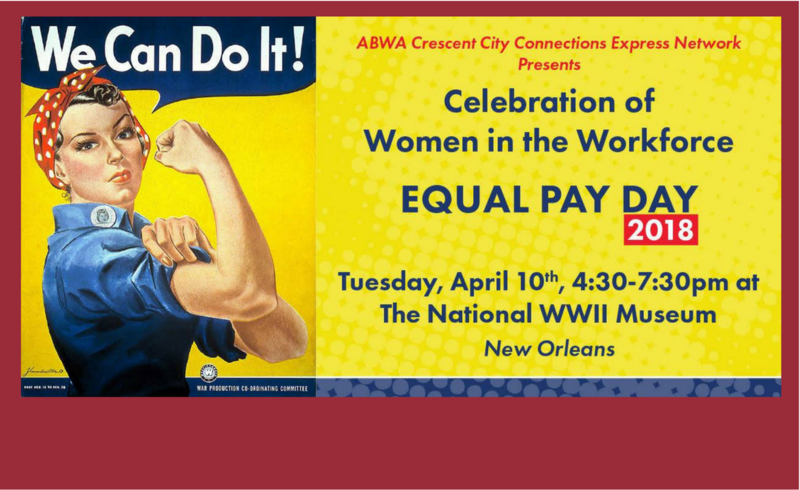 Our very successful Equal Pay Day celebration is celebrating its 3rd year on Tuesday, April 10, 2018. We have empowered hundreds and raised thousands in educational scholarship funds for local women. We invite you to join our event aimed at changing the lives of local business women and developing tomorrow's women leaders. Lelia Gowland helps make work work for women. Lelia started her company, Gowland LLC, because women kept coming to her for support in workplace negotiations and career decision-making. Now a sought-after speaker and writer on workplace dynamics for women, Lelia has worked with Fortune 500 companies such as GE and Expedia.com as well as professional associations across the country. Considered a thought leader in the field, Lelia is a weekly contributor to Forbes and has been profiled in Cosmopolitan and Marie Claire for her unique approach. Learn more at www.gowlandllc.com. Melissa Greenwell, Executive Vice President, and Chief Operating Officer, leads supply chain, information and technology, human resources, corporate communications and legal at The Finish Line, Inc., a national specialty athletic retailer. Melissa has applied her expertise in the design and development of organizations in many industries to help create high-performance companies. Her career includes senior leadership positions with The Finish Line, JP Morgan Chase, Sallie Mae, Brightpoint North America, Alcoa, and Made2Manage Systems. She is also a certified executive coach who helps men and women understand how they can leverage natural strengths and identify and affect behavioral changes that will help them succeed as senior leaders. Her work has been recognized in a number of professional publications including The Boss Magazine.com, Inc.com, Business Insider.com, Recruiter.com and on radio networks. Melissa is a frequent speaker on the topic of gender-diversity in leadership at organizations and conferences around the country in every industry.